Nyla Hampton fights her way past Kierra Thornton to score during the first half at Fairmont. Kloe Muntz nails a 3-point field goal during the first quarter at Trent Arena. Aubryanna Hall tries to make a pass while getting pressured by Mali Morgan-Elliott. Mya Dunson tries to score inside between Fairmont twin towers Madison Bartley and Madeline Westbeld (right). 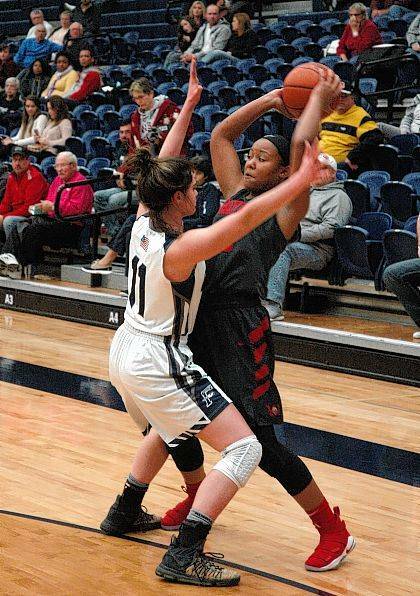 Olivia Trice drives the baseline against former teammate Mali Morgan-Elliott. 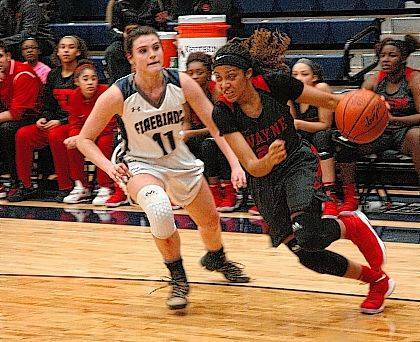 KETTERING — After leading by as many as 21 and 18 at halftime, the Wayne girls basketball had to fight hard Wednesday night to post a 48-41 victory at Fairmont. Mali Morgan-Elliott (11 points), who was a starter for Wayne last season but transferred to Fairmont, scored the first four points for the Lady Firebirds on two sets of free throws to give Fairmont an early 4-3 lead. Kloe Muntz and Olivia Trice each buried 3-pointers for Wayne and Trice tallied nine first quarter points to give the Lady Warriors a 16-8 lead entering the second period. 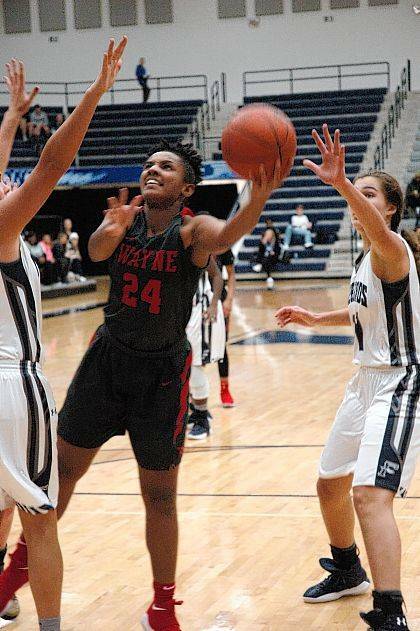 Trice scored another trey in the second quarter, as did Mya Dunson while Nyla Hampton and Aubryanna Hall scored four points each to boost Wayne’s lead to 33-15 at halftime. Kyra Willis picked up her third foul early in the third quarter and Jaida Wolfork her fourth and had to go to the bench. That changed the complexion of the game. 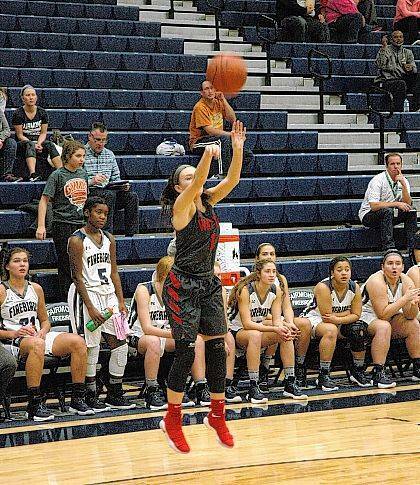 With several players hampered by illness all week the Lady Warriors were not at full strength and from that point on Fairmont began chipping away at Wayne’s lead. Madeline Westbeld, a 6-foot, 3-inch sophomore forward who was held scoreless in the first half, scored five third quarter points as did Morgan-Elliott and freshman guard Ashley Daniels had seven points to help Fairmont reduce Wayne’s lead to 38-32 by the end of the third quarter. Fairmont pulled to within five points with 2:15 remaining when Trice fouled Westbeld who converted both free throws. From there Wayne hung on by converting four of eight free throws while Fairmont managed to score only one more basket on a shot by Kierra Thornton to make the final tally 48-41. With the victory Wayne improves to 2-1 overall and 1-0 in the National East Division in the Greater Western Ohio Conference while Fairmont falls to 2-3 overall and 0-1 in division play. Wayne plays at Beavercreek on Saturday at 7:30 p.m. and hosts Wilmington on Monday at 7 p.m. Fairmont hosts Centerville at Trent Arena on Saturday at 7:30 p.m. then travels to Springboro on Wednesday. 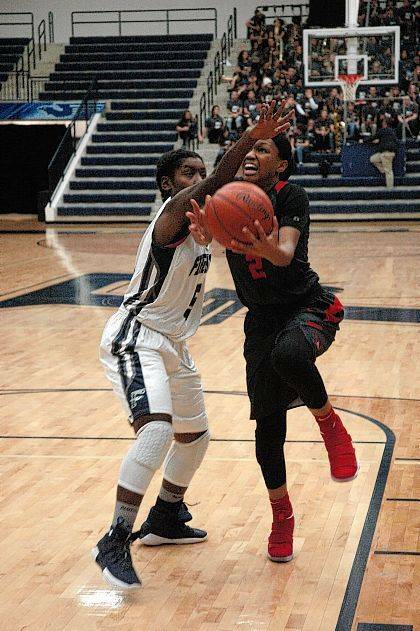 Wayne: Kloe Muntz 5, Nyla Hampton 6, Aubryanna Hall 11, Kyra Willis 6, Jaida Wolfork 2, Olivia Trice 15, Mya Dunson 3. Totals: 14-16-48. Fairmont: Kierra Thornton 2, Mali Morgan-Elliott 11, Madeline Westbeld 10, Madison Bartley 6, Iyerlan Alberts 3, Ashley Daniels 9. Totals: 13-12-41. 3-point goals: Wayne 4 (Trice 2, Muntz, Dunson), Fairmont 3 (Morgan-Elliott, Westbeld, Alberts). Records: Wayne 2-1 (1-0), Fairmont 2-3 (0-1).